As the holiday season is upon us, I realize that I don't need anything. But isn't it fun to make wishlists anyway? Here are a few things that I wouldn't mind Santa leaving under my Christmas tree (if I had put up a tree this year - which I didn't). 1. 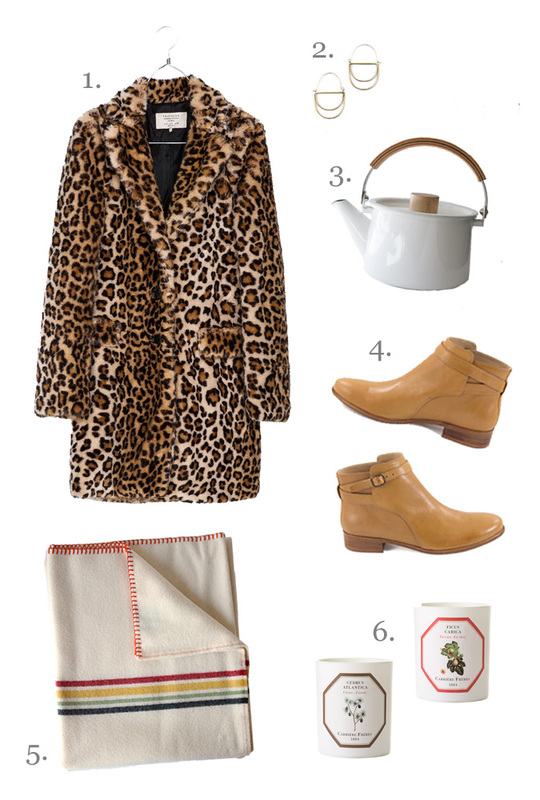 Zara Leopard Coat - It's so cold outside right now it's hard to find the motivation to get up and get dressed. A fun coat like this might be the kick I need to get going. 2. Delos Earrings - Not being much of a jewelry wearer, these simple, delicate earrings are right up my alley. 3. Tea Kettle - I'm not a coffee drinker, but I do consume copious amounts of herbal tea and hot chocolate to stave off the cold. A kettle of hot water on the stove would come in handy. 4. Sessun Boots - Do these really need an explanation? The perfect boots, really. 5. Woolrich Blanket - This blanket would come in handy for curling up on the couch with a good book or movie. 6. Scented Candles - With the windows closed for the winter, I miss the fresh air in the house. Some good wintery candles would get me through until the spring. When I was younger I never liked animal prints, I always thought they were so..."middle aged woman" BUT this was back then and now, well, I'm considering and liking them every day more. Just a detail, not a total look of course, but I like it. Actually that could reflect the fact that at 33 I'm a soon-to -be middle aged woman!